The 9-11 Memorial in Morris Plains, NJ that remembers two of our Cahners colleagues and the sister of a Cahners colleague. happening. My other thought was for my two colleagues who were on a plane to Cleveland for business. As soon as we found their flight information and made sure they were safe, I immediately drove to the elementary school where my Momma Kane taught to be with her. I tried to get her to leave and come to my mother’s house, but she wouldn’t budge. As I watch those who read the names, I am struck by all the children. I think about the generation that is growing up now who either weren’t old event to remember, or weren’t even born yet. For those of us who do remember, we are now entrusted with an important task; to help those children understand what happened that day and share our experiences. When I was in high school and learning about the Vietnam War, one of our teachers invited in two veterans that were former students of Belleville High School. They told us stories and their experiences. I was struck by how different they viewed their service. One was proud. The other, I could still feel his anger. That time became real to me, rather than just facts in a history book. Maybe that’s what teachers should do today. Not talk about the politics of the time, but what we all felt and went through. Help make it a real event for the next generation instead of just facts in their textbooks. My visit to the 9-11 Memorial in February, 2016. In February, I went to Ground Zero for the first time since shortly after that terrible day. My Momma and Pappa Kane brought me to Ground Zero after The Pile became The Hole, shortly after Pope John Paul II came to visit and pray. I had been there countless times before the attacks, but it was hard to orient myself and imagine where the streets were and where the buildings stood. I saw the tower lights up close. It was overwhelming. I am forever grateful that they brought me to that sacred place so I could pray for those who didn’t come home and be thankful that Pappa did come home. The sheer size of the space the Memorial was overwhelming. While it sits in the middle of the city that never sleeps, it is quiet there. People spoke in hushed tones and were caring and respectful. I wonder what will happen as time marches on. Will the names stop being read? Every December 7th, I think about Pearl Harbor, but that generation is quickly leaving this world. We remember as Americans, but do we really remember? Will 9-11 face the same fate? I pray not. 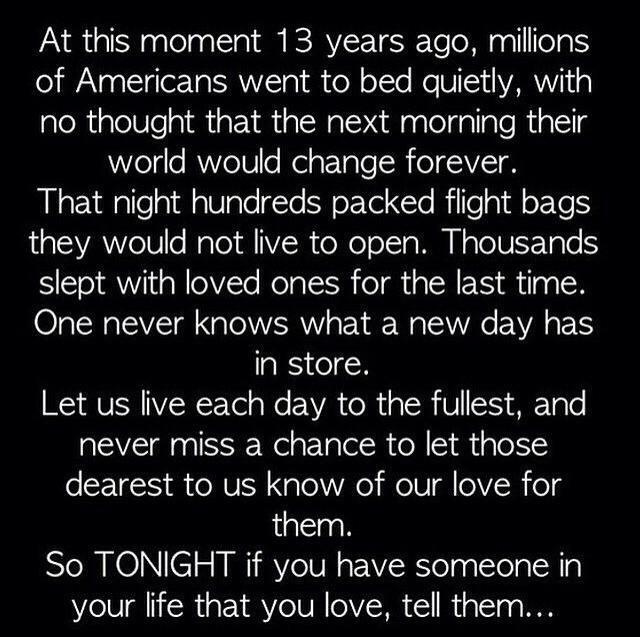 I pray we always remember. Not just the events of the day, but the people we lost and the people who came home. Fourteen Years Later – Do We Really Remember? This year, I ask one question – do we really remember? I get very melancholy as “the day” approaches. I usually ask myself why. Do I have a right to feel this way? I didn’t know anyone who died. I know “people of people.” I wasn’t even in New York. I was in my office in Jersey. I left work almost immediately. As I drove back to Belleville, and came closer to the smoke – and that smell – it really started to hit me. I felt numb, like thousands of others did, I am sure. I drove directly to the school where my friend’s mother worked. Her husband worked in the Twin Towers and I was worried for him. I had no idea what I could do, but I felt like that’s where I needed to be. I tried to get her to come back to my house, but she wanted to stay put. Thankfully, he was found alive. I can barely remember what I had for dinner last night, but I remember every minute of that day. I’m sure I’m not the only one. But by next week, with September 11th in the rear view mirror for another year, I wonder if people really remember or if it is just one day out of each year and that’s it. I remember a country truly united. I remember standing in line to buy desk flags for every person in my department. I remember seeing flags absolutely everywhere. I remember people bringing food to their emergency responders and saying “thank you.” I remember people being proud to be American. I feel like we are a country more divided than ever. That this horrific day is nothing more than a political football to push forward whatever the “agenda of the day” is. That there are people who have tried to take advantage of this tragedy for personal gain. This year I am bouncing between sickened, depressed, and angry. Each emotion for a different thought. A different memory. A different feeling. Even as I write this I know this post is more of a ramble and far less organized than posts in the past. Maybe this is part of what got me really thinking. I always think about “that day,” but not really what was going on the night before – all the normal things people do on any given evening. Everyone was worried about their day-to-day crap. The next day none of it mattered. This morning I had some jerk try to run me off the road because he didn’t like how I merged. I was angry and shaken. You know what? As I sit here writing this, it doesn’t matter at all. I was able to come home at the end of the day, kiss my husband, and say hello to my bird. The people who were killed by the men (and I don’t even like to call them “men”) who represented pure evil prevented those innocent souls from getting home, kissing their loved ones and having a normal day. Never forget what happened that terrible day. Pray for those families who wake up every morning without their loved ones. Remember those who knowingly gave their lives so a plane would go down in a field in Pennsylvania instead of the Capitol Building or the White House. Pray for those who lost their lives due to their service on “the pile.” But also remember to live a good life. That our being here is a gift that should not be squandered, because you never know it will all be over. Live a life your family would be proud of. Try to do something good every day and expect nothing in return. Be a good American. This week there was an incident with a woman who was shot and killed by law enforcement after ramming the White House gates with her car and hitting a Secret Service officer. After the fact of course, all the second guessing began. Did law enforcement need to fire on the vehicle? Did they know there was an infant in the car? If they did feel the need to fire, why didn’t they shoot out the tires? The family of the woman came out and said that she was suffering from postpartum psychosis and they felt law enforcement didn’t have to shoot. As always, there are three sides to every story; one side, the other side, and the truth. While I am sorry this woman had mental and emotional issues, I must stand behind law enforcement. These men and women put their lives on the line every day. Law enforcement in DC have an even more difficult job as they not only have to protect civilians, but Capitol landmarks, politicians, and more. They need to make split second decisions. This woman had already crashed a White House gate and rammed into a Secret Service officer, sending him onto her windshield. Another police officer was injured during a chase down Pennsylvania Avenue towards the Capitol. While she did not have a firearm, her car at that point was a deadly weapon. Did they know there was an infant in the vehicle? I don’t know. But she put her child in that vehicle and drove from Connecticut to DC that day. I have never had a child and never suffered from postpartum psychosis. I am obviously not a doctor, so I really don’t understand all that encompasses this condition. I understand the woman’s family defending her situation and feeling the police should’ve done more to preserve her life. And I am sorry this woman lost her life. I have many friends and family members in law enforcement and I can say with confidence that police do not use their weapons lightly. It is not something they look forward to doing and understand the ramifications of using their weapon. Did they know she didn’t have a weapon? No idea, but I doubt it. Again, the moment she sent a Secret Service officer flying, she used her car as a deadly weapon. I will always give law enforcement the benefit of the doubt. Period. I ask the questions to those second-guessing law enforcement, did you know if that woman had firearms in that vehicle? Did you know if her car was loaded with explosives and could’ve been a terrorist attempting to take advantage of the government shutdown? What would you have done if you had a weapon and had a car coming towards you at full speed? It is important that law enforcement review every situation and determine if anything could be learned from the response. However, when an officer is put in that situation, all their training kicks in and they will do what they feel is the right thing to keep the area safe and protected. Just like no one knew what was going through that woman’s mind, no one knew what was going through the minds of law enforcement on a second-by-second basis in a fluid situation in one of the toughest places to protect in the country.